Separation anxiety can appear in many forms. Most of your preschoolers will transition smoothly into the classroom. However, you will have a few that will not. They may sit quietly on a chair and not interact. They may cry. They may hold on to their parent’s leg for dear life! They may have an all out breakdown. What's a preschool teacher to do to help children and parents during this tough time? 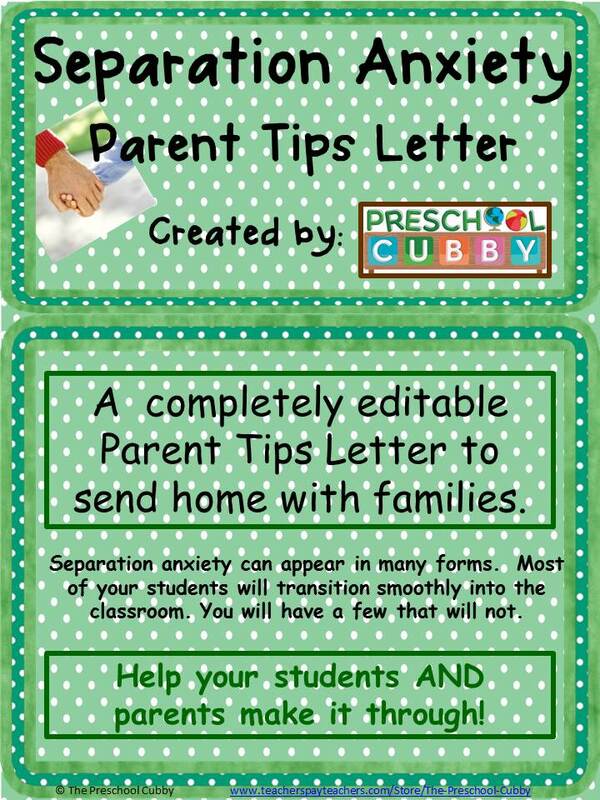 This Separation Anxiety Parents Tip letter can be printed out and sent home to parents. It is completely editable so that you can add your own Program information as well as add, delete or change any of the tips or suggestions to reflect your program's plan. 8 Page COMPLETELY EDITABLE Letter to send home to families! This Separation Anxiety Parents Tip letter can be printed out and sent home to parents. It is completely editable so that you can add your own Program information as well as add, delete or change any of the tips or suggestions to reflect your program's plan.